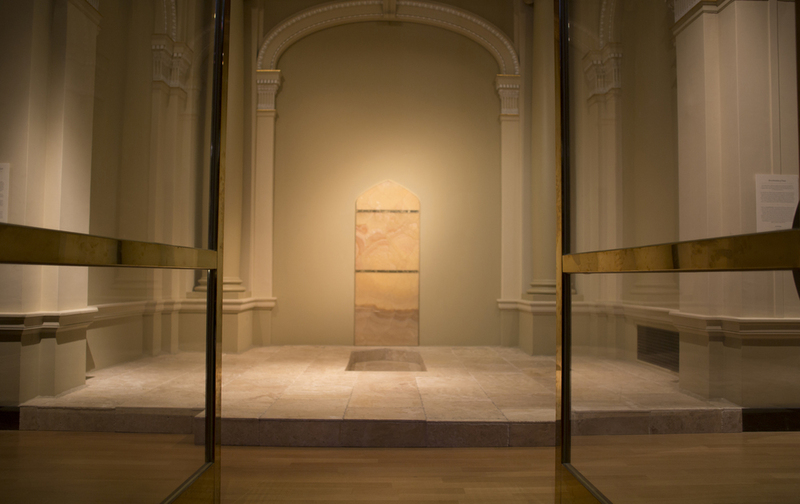 In an invitation to respond to Reverberations of Stone, Taraneh Hemami’s installation at the St. Ignatius Church in San Francisco, notions of representation and its absence kept emanating, particularly in relation to the context of the church and the abundance of religious iconography and figurative imagery. Aniconism in Islam, as well as veiling and censorship, all belong to the same constellation that abstains from, perhaps disrupts, representation. In its reconfiguring of a mihrab, Reverberations of Stone faithfully evokes that tradition while at the same time becoming an image itself, an icon, and taken to the extreme, a “blasphemy.” Blasphemies are done without, censored and muted. Mismar's response to the work then becomes covering it up in a meticulous way that only brings attention to the act of creating it, tile by tile. In troubling and hiding the existing image, a new one emerges that only reinforces it.